Our weekly report is ready. 2. 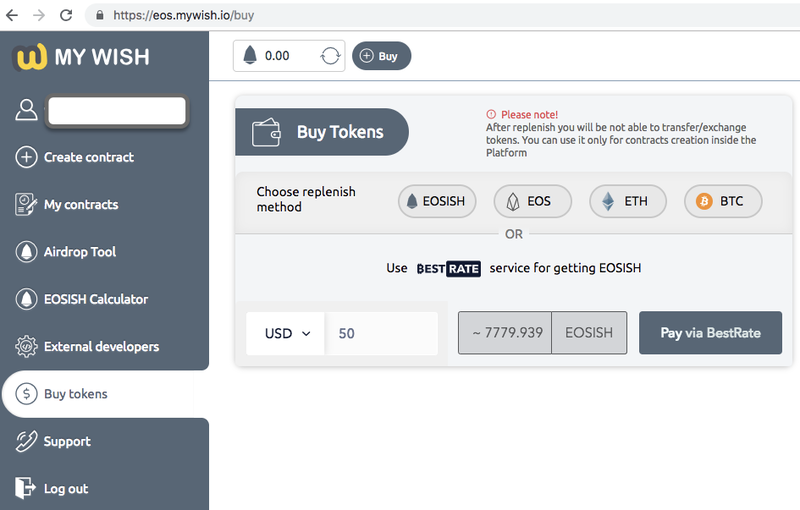 BestRate “a payment provider includes fiat payments” was successfully integrated into https://eos.mywish.io/contracts. You can now pay in USD, EUR or by more than 80 Cryptocurrencies. All payments are converted to WISH/EOSISH and then sent to the MyWish platform. 3. Adding BestRate to contracts.mywish.io is planned to be in December. 4. Lynx & Meet.one integrations are an on-going processes. But it’s a little bit behind of the schedule because of the teams’ external tasks. 5. EOS Token tests automation completed. We are working on Crowdsale contract autotesting for EOS. 1. The EOSPark&MyWish contest has finished, thank you all for participating and congratulations for our winners, we have sent a dm to all of the 10 winners on Twitter, we will provide you soon with the instructions to get the free EOS account. 2. We have presented a 20min presentation in the EOS Summit, we talked about MyWish, our future plans, and our partners. If you missed the Summit stay tuned we will publish the presentation video on our official Youtube channel, also we will send a presentation to all the participants. 3. Due to the market drop, we have changed the ETH fees for creating Token and Crowdsale contracts, to be 2.99 ETH for the Token contract and 4.99 ETH for the Crowdsale contract. 4. We have designed new banners for the advertising campaign for raising the number of EOS token contract creation, we are working every day to improve the results of this campaign, and to achieve its purposes, however, we are trying to keep up with the Google system as it blocks the crypto ads, also we decreased the budget for the ads slightly due to the market drop. 5. Listing WISH and EOSISH on good exchanges is our priority now, every day we are filling a lot of forms, applying and contacting many exchanges for that purpose. We have a new listing announcement coming soon. 6. We didn’t stop our partnership program, we have meetings every day with companies in the EOS community, we discuss the opportunity for partnership, we will have some good news regarding the program next week, so stay tuned. We would like to thank the community for continuous support.